Can I Get a Dental Implant Immediately After a Tooth Extraction? The answer to that question is a resounding … It depends. There are many different scenarios that could result in a tooth extraction. The tooth could have been cracked or broken due to an accident. It’s also possible that periodontal disease led to infection in the surrounding tissue or bone. What the surgeon finds when he accesses the area after the tooth is taken out dictates whether or not an implant can be immediately placed. Your dentist and surgeon will have some idea of what is going on when they view your x-rays, but x-rays cannot tell the whole story since they cannot detect soft tissue. The full extent of any damage, infection, or bone loss is best ascertained when the surgeon views the area first hand. This is why, when Dr. Loschiavo extracts a tooth, he is prepared for a myriad of options. Every case is different and must be approached individually. 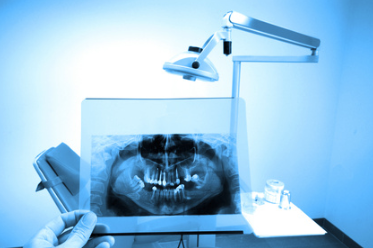 Dr. Loschiavo will review your x-rays with you prior to any procedure and will discuss with you what he expects to find and what options he will have based on what he discovers during the procedure itself. If there is no sign of infection or significant bone loss when the tooth is extracted, Dr. Loschiavo can immediately place a dental implant during the same procedure. He extracts the tooth and then does minimal bone grafting to secure the dental implant into the open space. If desired, a temporary crown can be placed. After 3-4 months the implant has had time to be assimilated into the jawbone and the temporary crown can be replaced by a permanent crown. If however Dr. Loschiavo discovers any infection or significant bone loss during the tooth extraction procedure, those issues must be addressed and resolved prior to the insertion of a dental implant. After extracting the tooth, Dr. Loschiavo would completely remove all infected tissue and bone. After giving the body 3 months to heal and grow as much bone as possible on its own, Dr Loschiavo could then do any remaining bone grafting that is needed to anchor the dental implant. We are more than happy to answer any questions you may have. Contact us!